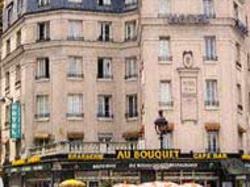 Hotel de la Terrasse is ideally situated close to the biggest antique market in the world (Marché des Puces), just five minutes‘ walk to the Sacré-Coeur (Basilica of the Sacred Heart), near the Cité de Sciences (Science Museum) and the main tourist and business attractions of Paris. Hôtel la Terrasse offers a warm and friendly welcome. All rooms are equipped with shower, WC, direct dial tephone lines and TV. Porte de Clignancourt Underground station.